if i told you about two lovely granny chic loving crafters whom i admire. perhaps even turning me a little faint. she caught my 'granny chic loving' eye a few months back. after all, an ercol couch would stop most granny chic folks in their tracks. 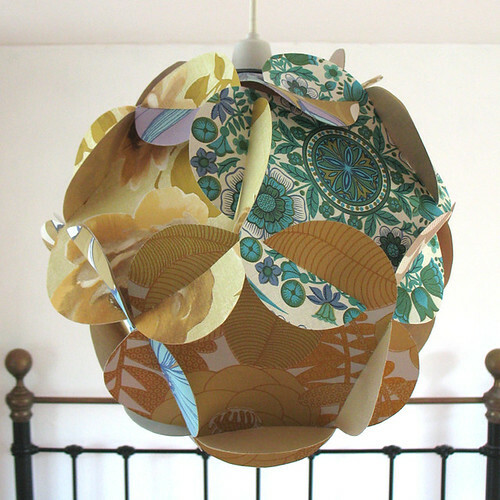 but her wonderful bark cloth and wall paper lampshades. for mossy shed would look most grand decked out in folly and glee shades. for her shelves truly are stocked with eclectic housewares that quicken my heart. and she also has the most fabby wallpapered walls in her nest. 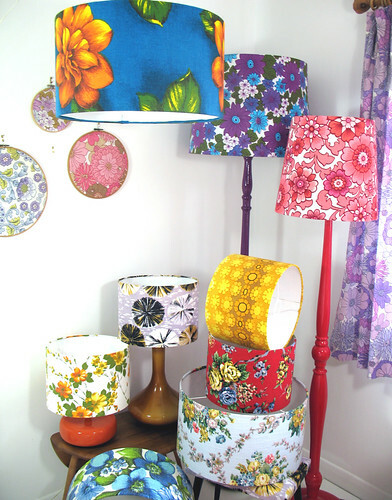 and it is full of eclectic pretty wares made from vintage fabrics. whilst all around is not going according to plan. i think that in it's self proves what a apron of the utmost kind it is. 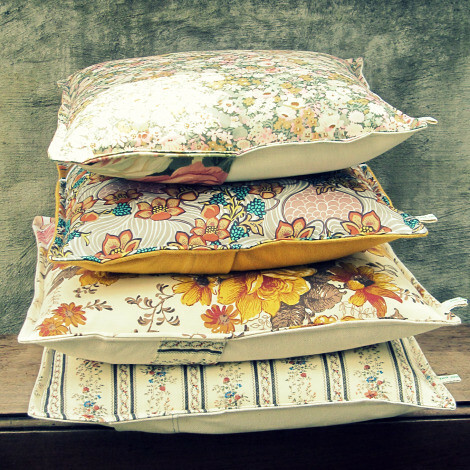 rachelle also dabbles in other lovelies like cushions, tea cosies and other good old granny stuff. 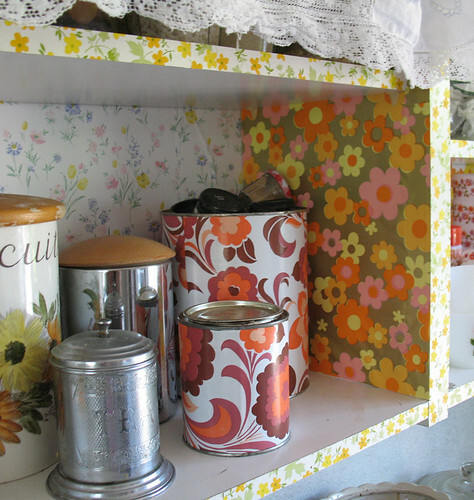 there is nothing quite like a bit of granny chic to start the weekend on a lovely note. footynote: please do note all images shown today belong to polly and rachelle and their granny loving selves. How lovely, so nice to go visiting some more Granny goodness type sites. Your retreat sounded fab, glad you had such a great time! thanks for sharing- they're wonderful! Awwww....your blog amkes me happy! 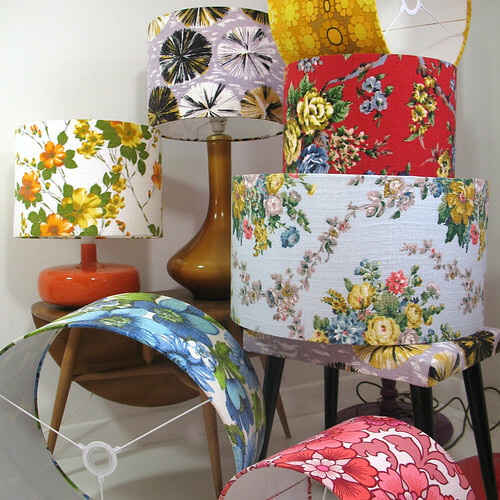 Sooo pretty..loving those lamp shades! and the fab sticky back plastic..?? on those shelves. Oh, lovely! There both new to me, so thanks muchly for the intros & their pretty pictures! :) Yay, granny chic! hello. after strolling through the flickr album of your perfectly peachy weekend, I decided that a twenty-something can definitely join in on the granny chic just as well as anyone and took on the Dottie Angel Challenge of the Utmost Kind. I already had a (primarily) handmade wedding last summer and I still have an apartment full of thrifted items and I'm building a closet full as well...so it's lovely to have an adorable name for what I've been up to! I adore your blog so much that it's bookmarked in my browser, just one click away! 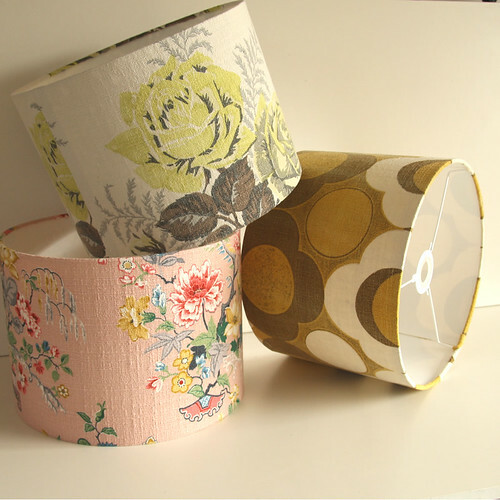 Some brilliant granny chic things. Particularly love the dresses. 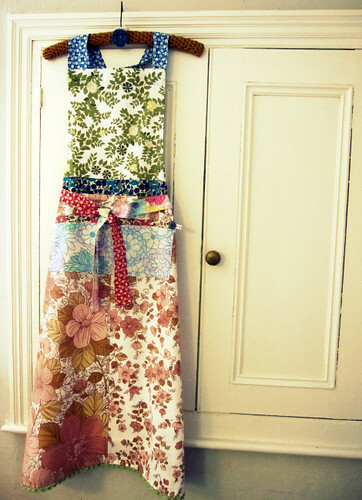 Lol, just realised they are aprons...... but you know what..... the designs WOULD make fantastic dresses. Oh you are such a bad influence, Tif. I HAD to buy one of the aprons! Especially when I realised Rachelle was here in Yorkshire! rachelle sweetie, you are most welcome, i wore my pinny last night and thought of you!!! polly, gosh to think you sit on one everyday is amazing to me! katie bee, wonderful my dear, hurrah for you :) delighted you are inspired to join the challenge!